In the sixth month of Elizabeth’s pregnancy, God sent the angel Gabriel to Nazareth, a town in Galilee, to a virgin pledged to be married to a man named Joseph, a descendant of David. The virgin’s name was Mary. The angel went to her and said, “Greetings, you who are highly favored! 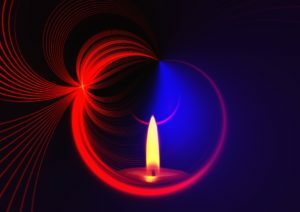 The Lord is with you.” Mary was greatly troubled at his words and wondered what kind of greeting this might be. But the angel said to her, “Do not be afraid, Mary; you have found favor with God. Fear is such a common emotion! We fear simple things – spiders, a failed dinner, flying, public speaking. We fear bigger things – not being able to meet our responsibilities, what others think of us, pain, death. 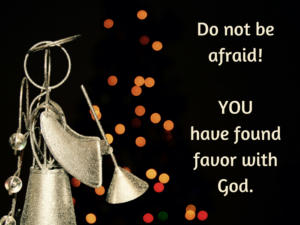 You and I … we have found favor with God! This entry was posted in Advent, Reflection and tagged 2 Timothy 1:7, Advent, Christmas, Fear, Isaiah 41:10, John 14:27, Joshua 1:9, Luke 1:26-30, Psalm 34:4, Psalm 56:3-4 on December 16, 2016 by instillnessthedancing.